A balancing act. The Surface Pro is an interesting concept tablet that Microsoft developed to showcase the strength of the Windows 8 platform on a touch-capable device. This is another Wintel collaboration that is able to use the ecosystem of apps available for the X86 Windows platform. This review points out the strengths and weaknesses of this form-factor. The Microsoft Surface RT had a number of disadvantages regarding its relevance to the normal user. It was always going to be bogged down by incompatibilities with the existing software ecosystem developed around the X86 version of Windows 8. The Surface Pro is the device that is similar to the Windows RT tablet but uses the established Intel processor technology. The advantages are abundantly obvious: Windows compatible software and hardware can both be used without problems, in the same way as other Windows PCs, which circumvents the requirement for additional accessories or to wait for custom applications. Apart from this, the available hardware including everything from a hard drive to a shared printer or a DVB-T receiver can be used without any compatibility issues. This means that development and user costs are low for this device. Right now, the Microsoft Surface Pro isn’t available in Germany and the website does not mention any date of availability. For the purposes of this review we used a US model with a storage capacity of 64 GB. The other option available for sale is the 128 GB version. We can only speculate on the price of the device when it is made available in Germany and we estimate it to be around the 800 Euros (~$1050) mark. The device is mostly edges and sharp corners that make it stand-out among other devices with the same form-factor. The magnesium alloy case is well made and the individual elements have been assembled with precision. The rigidity of the case is very good, and can be directly compared to that of the iPad. The kickstand integrated into the back which allows the device to be propped up, proves itself to be very practical; although we need to point out that there is only one position possible. The powerful hardware components and the material of construction contributed to the weight of the device which came out to be about 920 grams. This may be light enough for comfortable transportation in a sleeve or in a bag, but not for holding in one hand for anything longer than a few minutes. Our comparison device, the iPad 3 is almost 300 grams lighter at 650 grams, making it much more comfortable to hold in one hand. We expected the thickness of the device to negatively impact the user experience but we found it to be a decent form-factor to hold making it comfortable to use with one hand for at least short periods. To make the device appeal to businesses, Microsoft has included the mini-Display port and the mini-HDMI port for external display connections. We were not able to check if the ports were able to output a higher resolution than 1080p as we did not have the appropriate monitor at the time of writing this review. The device does not include a Thunderbolt port. The USB port present was the faster USB 3.0 version which allowed us reach read speeds of 238 MB/s using a solid state external hard drive. Under the Windows logo, there is a form of docking port that allows for the integration of an external keyboard if necessary. There are no other ports on the device. On the right side of the tablet, there is a somewhat smaller, but otherwise identical type of connector, which is intended for the power supply or the input pen. The power supply also has an integrated USB port (5 watts) for charging external devices such as smartphones and MP3 players. With PC Mark 7, the Microsoft Surface Pro achieves an identical result as the Dell XPS 13 and the Acer Aspire S7-191 with 4813 points. A large portion of this can be attributed to the dualchannel mode of the RAM modules and the superfast solid state drive. The only improvements that can be done would be the upgrade to a better CPU-GPU combination and reducing the energy footprint. During practical use, most of the regular Windows programs can be used without any concerns. Only in the case of demanding 3D applications do considerable restrictions apply. When it comes to the typical tablet benchmarks such as Geekbench or Sunspider, the Microsoft Surface Pro is in a league of its own as it is able to outperform all its rivals by a considerable margin. Micron's Real SSD C400 is the storage device of choice and is connected to s SATA III port. The SSD can take full advantage of the bandwidth that is available. Sequential reads top out at about 500 MB/s while sequential writes are measured at about 87 MB/s. This is a limitation of the SSD firmware and the type of flash chip arrangement that has been used. The 128GB version of the Crucial SSD which is probably the same as the one adopted for the 128GB Surface Pro should be a little faster in this respect. Normal workloads don’t include much writing to the drive and there is also an issue of much of the storage space being occupied by the operating system. Following harsh criticism from users and the media, there is at least a note of caution on Microsoft's product website that warns of the fact that the system software takes up a sizable part of the storage space. Here is the math: Of the 64 GB in total, the user has about 26 GB available for programs and data. Expanding the storage capacity is possible with an SDXC memory card or via the USB 3.0 port with an external drive. Intel's HD Graphics 4000 has a clock speed of up to 1050 MHz in the Microsoft Surface Pro and is not subject to any throttling. During 3D Mark 11, a score of 626 points is achieved while 3D Mark Vantage produces a score of 2935 points. The performance during OpenGL Shading is about 5537 points in Cinebench R10, and 15.78 fps in Cinebench R11.5. These scores are average for a device of this class running Intel HD Graphics 4000. More results can be found in our comprehensive GPU benchmark list. While running on the battery, the GPU runs at a frequency of only 350 MHz, which leads to a considerably lower result in Cinebench R11.5 of 6.67 fps. With the power connected we weren't able to detect any throttling on maximum utilization. The gaming performance is sufficient to play leisurely PC games smoothly at low resolutions and reduced quality. This is only possible with the power adapter connected. During battery powered use, the reduced clock speed of the GPU takes its toll leading to a reduction of the frame rate anywhere between 30 to 50 percent depending on the game. 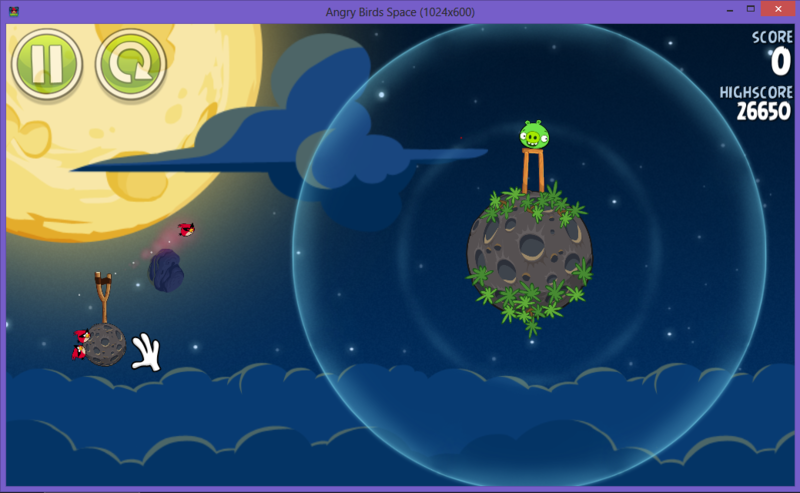 Games specially developed for tablets such as Angry Birds Space or Galaxy on Fire 2 HD are always a viable option due to their minimal processing demands, and shouldn't pose a problem when running on the battery.